Anyway, it's easy to overlook P's reaction because it is subtle, but after watching specifically for his reaction, it is definitely there. (Arsenio mentions having a son at 9:00 in the video here: https://www.youtube.com/w...hHwTLZpE). 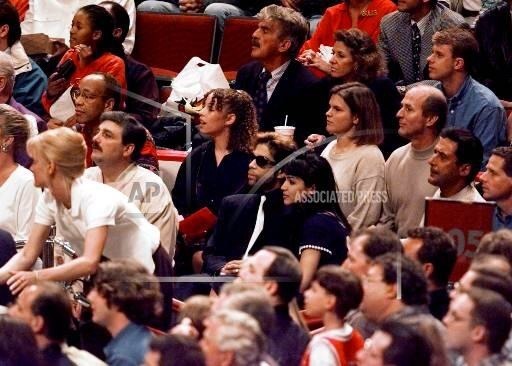 Prince had just gotten up out of his seat and walked in a humorous way, like "I'm about to leave if you keep talking about this after-hours party from years ago". Then, Arsenio mentions having a son, and I see Prince has a change in demeanor. (I always fear that I'm reading too much into a person's emotions when I'm looking for them like I was when watching for this moment in the video.) Prince waits a few seconds, then says "Congratulations," but he says it in a very flat, brief, and polite manner; there's no emotion to the "Congratulations" at all. 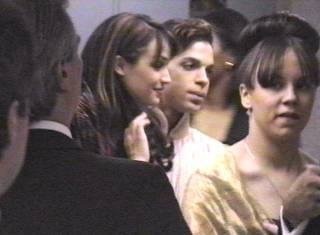 Also, Prince doesn't ask for any additional information about Arsenio's son (e.g., what his name is, how old he is). Now of course, he's the one being interviewed (the interviewee), but I would expect the interviewee to show more emotion or ask for a little bit of information about the interviewer's child, like "Congratulations! How old is he? What's his name?" Arsenio's show was on late-night television, so the interviews are more of a conversation, if you will, than on a show like 60 Minutes. Prince wipes his nose at 9:05. He also wiped his nose again at 9:39. I went back and looked to see if he touched his face like that before the moment Arsenio mentions his own son. He did not wipe his nose at all prior to Arsenio mentioning his own son, only after Arsenio mentions having a son. I also notice at 9:42-43, Prince bites his lip, which is the first time I saw that occur in the interview. Then, look at the way he reacts at 9:44 when Arsenio says "good times"; he nods quickly in an almost "let's keep it moving" kind of way. 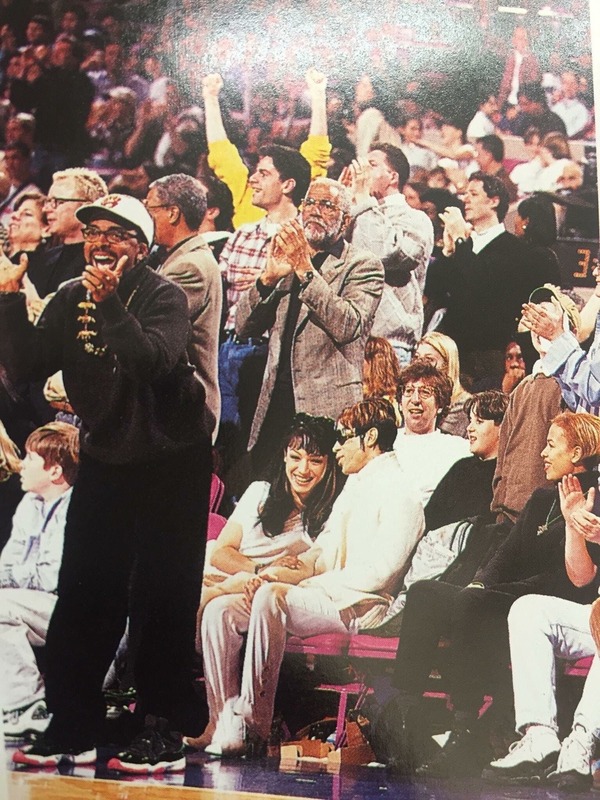 Then, at 9:54, Prince very briefly exhibits a really sad look on his face as the camera pans across the set and Arsenio is saying that they're going to take a commercial break. Overall, Prince plays off his emotions well. The reaction to Arsenio talking about his own son was subtle, and for a casual viewer, it is easy to miss the change in Prince's demeanor. I don't want to sound like I'm seeing things in that situation that weren't there, but it was clear to me from the way that Prince reacted to Arsenio mentioning his son, that the loss of his son still affected him in 2014, all those years later. I rewatched the interview based on your comment and agree. Many have said he never got over his son’s death and I can see it in the interview. In 2015 Prince posted a photo on IG from the mid 90's with Mayte in the background and he's playing the bass with her eye painted on it.When I saw that I did wonder if he had been thinking about her and perhaps missing their time together. I would like to see the photo..where is it? If he put it up in 2015 then yes I like to believe he was still thinking of her and perhaps missed her, missed their life together and missed his family. This would have been after the 2014 Arsenio interview. www.instagram.com/p/9KEGSAGLdB/ It's having trouble linking but it should work if you type it in. Someone commented that he posted it on his son's Birthday in October 2015. This is new 2 me. 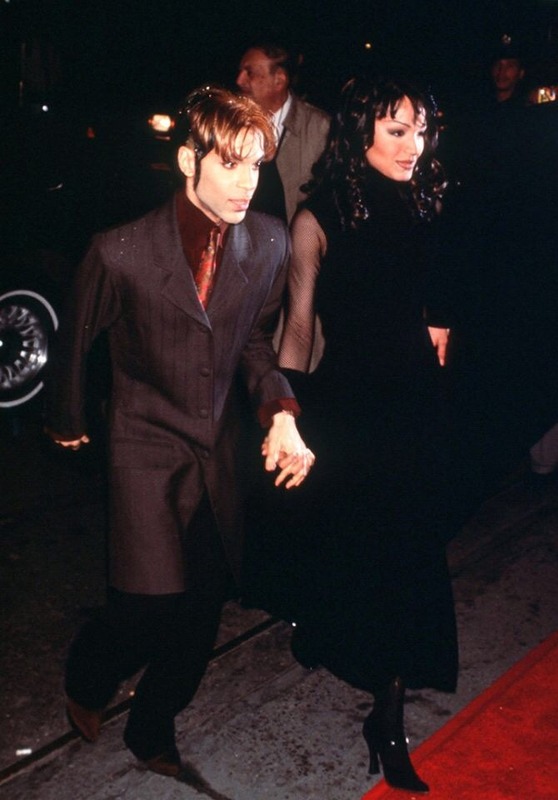 Prince performs with Mayte and other dancers during the VH1 Fashion & Music Awards show in New York on Dec. 3, 1995. Monday we drove 500 Km to Hamburg, Germany. Driving in the evening would give us some benefit regarding busy traffic and we made it in 5 hours. After a restless night in Hamburg we met the people from The Continental Magazine and the O)+> Network. We were expected at Hotel Ramada at 12 O'clock. We were friendly welcomed at the hotel by an EDEL employee (Tina) and told that there was a tight schedule and we were given 25 minutes of interviewing time. We thanked her for the opportunity that for once the Fanzines got an interview with a key member of the NPG. In the lobby of the Ramada Hotel we were waiting for things to come. Nervous as we were, we at first didn't recognize Mayte's mother who was also waiting there. (We spoke to her after the Mayte interview). We had to wait another half hour because some interviews took longer than planned. Looking down I noticed that the carpet in the hotellobby was Paisley styled . Coincidence ?. If you have to wait for something and don't know what to do else you start looking around and try to find some unusual things. Two girls at the desk were wearing broches with golden suns on their dresses. Coincidence ? I heard myself sing: These are the days of the children of the sun..... At some point the EDEL spokeswoman came by to get us for the interview. Funny what your heart and stomache can do. It can even take a rollercoaster ride with you...... Up to the second floor with the elevator we were told to wait outside room 224. After a minute ( which seems to have lasted a century.. ) we were invited in. Mayte was sitting in a big chair near the window and welcomed all of us, asking our names . We were invited to take place on the bed or to just sit down at the floor where pillows were laying. For a moment it was silent, you could hear your own heartbeat. Everyone had to realise first that this was it. You listen to the music, you see her in shows, you see her dance in videos and now she is sitting there in front of you. Smiling that big smile. Looking right through you with those big brown eyes........... After waking up I thought we better get started with the questions since we only had 25 minutes. Pictures shot by Thomas Hellmig and Ulla Kern . Yesterday you were in Munich and today here in Hamburg. The next 2 days you will be in Holland. Where else will this promotiontour take you ? MAYTE: We will do 4 Television shows in London. We go to Spain . MAYTE: It will be Madrid this time. We will visit Oslo, Stockholm, Bologna. Friday I return to Hamburg and have a photoshoot with AMICA [ German Magazine, first issue out in January 1996 ] . She smiled and was really looking forward to this..
MAYTE: I come back to Germany on November 2nd for a TV show on RTL in Cologne, I think it's called the Late show. Are you going to perform ? It will just be you ? Are you doing other TV appearances ? MAYTE: Yeah, in London and I'm doing one in Bologna, I think it's Italy. I'm doing like four in London. Top of the Pops, MTV, I did the Box, VIVA and now I'm doing VIVA 2. Let's see.... and there is another one in London, I'm not sure about. We only saw two songs from that show..
MAYTE: Oooh, you didn't see the whole jamsession ? That was fun !! I think before we are going to talk about your Album now, ... you've been a tremendous influence for his albums, the 92 album and the Gold Experience as well. So, in what way was your influence different when he wrote the songs for the 92 album and now for the Gold Experience ? MAYTE: Well , because I'm...the influence, I mean...because I changed, of course, people change of course, with the Symbol Album I was ... we were doing the... it was kinda like the movie thing... we were keeping that... and then with the Gold Experience.. we just went crazy..you know, we did NOW and you know... I changed, I started stagediving...from ballet to bellydancing to stagediving, do all that kind of stuff. So we kind of all changed as a group. Because, I mean, The NPG as a band has a big influence, big time ! So it was an evolution from the balletdance to a.......? 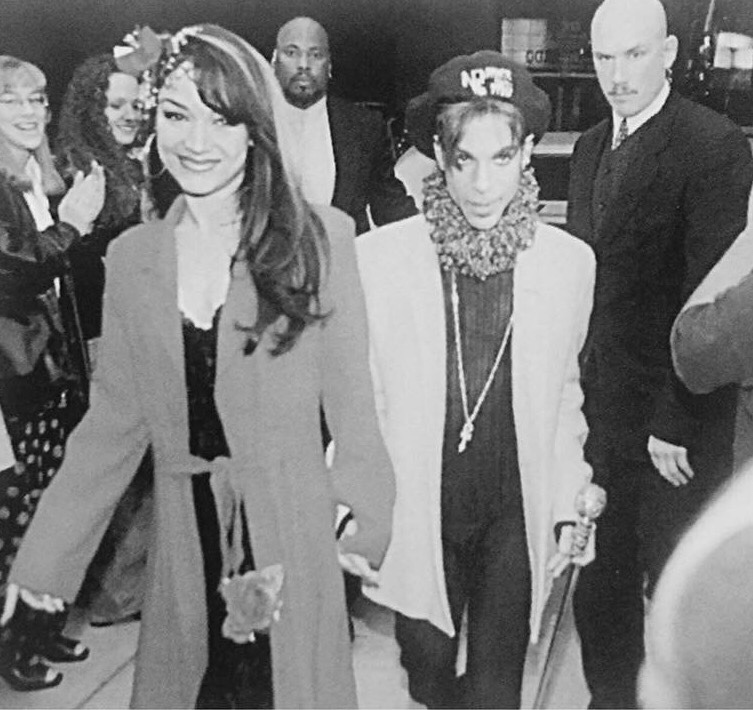 MAYTE: Yeah, I grew as a dancer and performer and the musicians grew as musicians of course. So you say it was also reflected on the music on the albums ? Emancipation is the keyword now ? All the fans have to emancipate to listen to his new work and be open to it ? Is the band is really close ? On his last Love 4 one another show he said.. he was feeling sick and he said: Mayte is not here and that makes it worse.. The band is that close? MAYTE: Always dancing, always running around, getting thee.. asking me ... it's like .. we are a family and always creating. If somebody is missing you feel it. Actually he played last night. Anybody know that ? MAYTE: He played last night. And then he told everyone that I was in Europe promoting my album. How much influence does he have on the current album ? MAYTE: On Child of the Sun ? A lot !! He wrote every song. He read my mind. Because it's exactly what I wanted to say on my album, on my first album. I'm very proud of it. The NPG played on it too. On Baby don't care, he did the percussion ?? 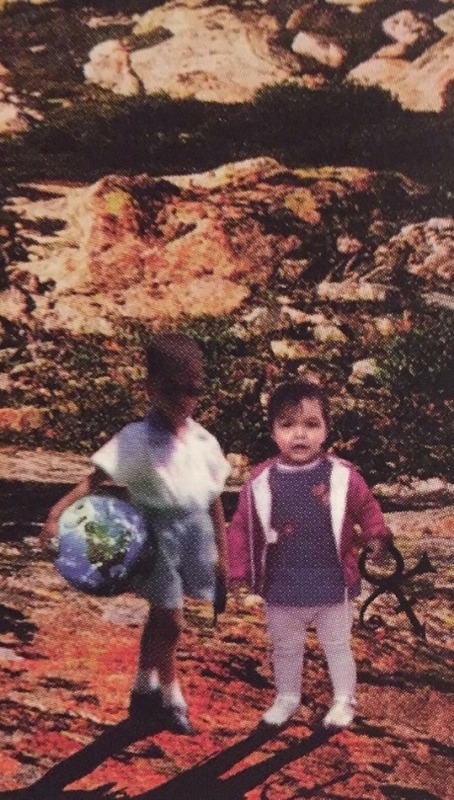 Did he write Children of the Sun ( the first track on the album ) especially for your album ? MAYTE: Yes, he wrote that specially for my album. On Exodus there is a line that goes .. these are the days of the children in the sun.. and now you sing... we are the children of the sun, we're gonna dance till the morning sun..
MAYTE: That was a....because so many things are happening bad in the States that I wanted that to be.. I wanted to have a song that would make the people better and he came up with that.. and it was perfect.. I had a change to listen to the album and the song had the same impact on me as Play in the sunshine from the SOTT Album. First a happy song and then you go on .. There are no less then 2 cover versions on your album. If I love U 2night, the current single and Love's no Fun. Who decided to record these version ? If I love you tonight has a beautiful video . There is a scene with a man in the car. Is that Frank Williams, the dancer ? On If I love U 2night there's a line that goes: I'm looking for a remedy for all this misery... What is your remedy for misery ? In your gracious name, the second song on the Album, to me it's a potential single release. MAYTE: Actually we are thinking about doing that as a second one. we already got.. we are ready to shoot the video.. He's thinking about directing me too. He is gonna do this one for me. I would like to go back in history, before your first single "The Most Beautiful Boy in the World" was released one year ago, I think two or three years ago they had two releases on the EDEL company's label, Broken Wings...and Too Dramatic ... I've got one of those here. MAYTE: Ooohh!! Throw it away!! Throw it away!! Trow it awaaaaaay !!! OK. I just want to know, can you remember when you actually recorded those songs? That was back at the time you were here in Germany? MAYTE: Oh yeah, they put them out. ... once you started dancing for him. Are there any plans to promote your album live? There will be no tour this year in America ? 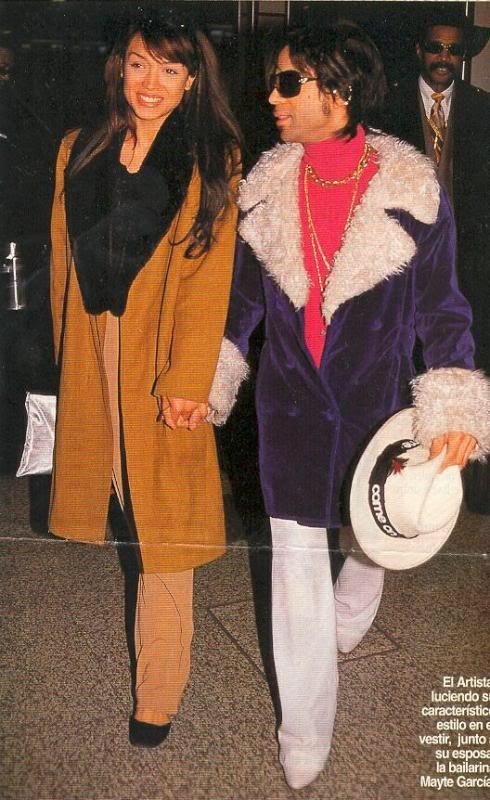 MAYTE: I know in December we're doing a show for VH1, the Fashion Awards. We're doing that and then we're planning on doing a TV special which is also in December, and then we start out in January. So you're not coming to Europe for the MTV European Music Awards? MAYTE: Not that I know of, there's no plans for that. MAYTE: Actually since I was coming here, he was thinking about it, I don't know if he booked it or, you know, but who knows? MAYTE: I'm here for two weeks. And the band, they're dying, The NPG, they're dying to travel. They wanna play. soulmates, i feel the others loves were life mates. Can you imagine having and losing 2 soulmates. please google the difference if you need. For a while all of his posts were showing that date for some reason.His original account was opened in 2014 after the Arsenio appearance and later deleted in 2015.I believe October 22,2015 was when the account he was using in 2016 was created. 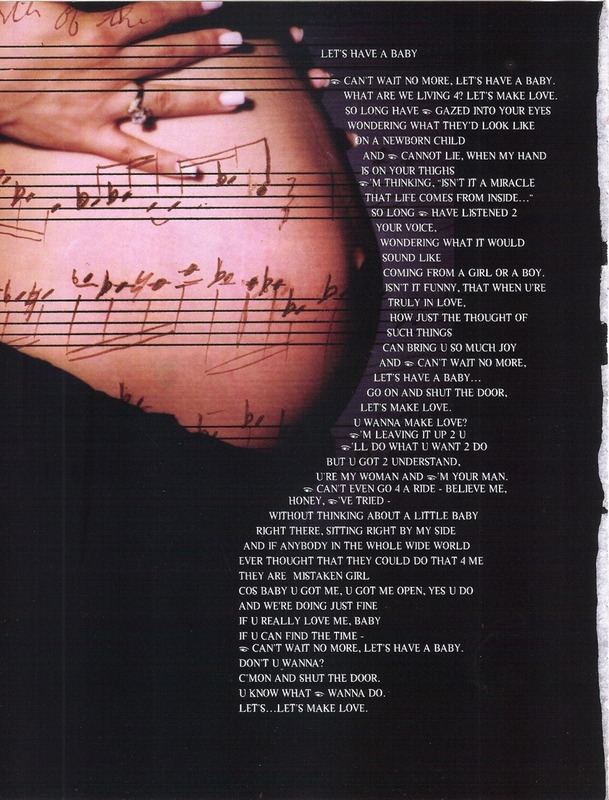 Emancipation album liner notes. I love this.